Ever see a movie where the hero needs to copy some critical computer data, and all that he has to use is an iPod? Now you too can use an iPod to store any type of data, and the great news is that it's effortless. One day I was browsing eBay for an external hard drive to back up files, and four iPod listings came up. I was initially puzzled but quickly realized the obvious truth. In essence, the iPod is just an external hard drive with an LCD and pretty buttons! Windows aptly labels the iPod a USB Mass Storage Device, which is also the label given to Flash Drives, Key Drives, Memory Sticks, or whatever name suits your fancy. And the operations are all the same. Plug in your iPod, and Windows automatically mounts it to the system. 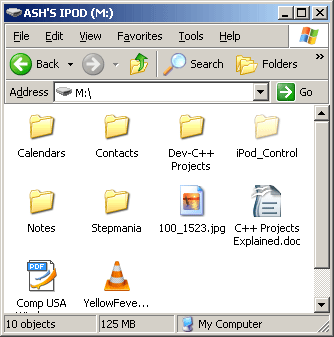 Then you can use Windows Explorer to drag and drop, delete, create folders, and move files on your iPod to your heart's content. This method will even allow you to bypass iTunes for managing files on your iPod, and allow you to see the nifty system files that the iPod runs on, which wouldn't be a good idea to mess around with, unless you know what you're getting into. But just because you can copy any file to an iPod doesn't mean it'll know what to do with it. The iPod itself won't be able to play videos (unless you have a video iPod), open documents, or run programs. Using it as a storage device entails just that: storage. Due to its small size compared with modern hard drives, the iPod probably isn't ideal for backing up your entire movie collection. But if you need to copy only a couple large files, an iPod you already own may just be large enough for the job.